Thousands queue for Eurostar in London Jump to media player Thousands of passengers have been queueing at St Pancras station in London trying to get a seat on Eurostar trains. 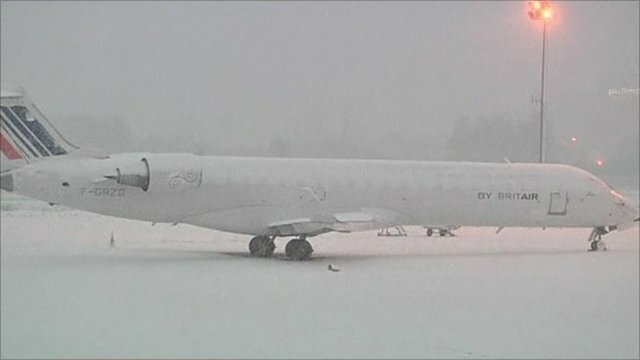 Airlines count cost of snow Jump to media player In a year of ash clouds, strikes and now heavy snow how has the aviation industry coped? Thousands of passengers have been queueing at St Pancras station in London trying to get a seat on Eurostar trains. The station was so busy that many had to wait outside, lined up around the terminal building. Eurostar is now asking all passengers with bookings to stay away as they try to clear the huge backlog caused by snowy conditions. The BBC's Jon Brain reports from St Pancras station.